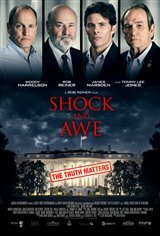 Two Washington reporters, Jonathan Landay (Woody Harrelson) and Warren Strobel (James Marsden), along with their boss, John Walcott (Rob Reiner), and war correspondent, Joe Galloway (Tommy Lee Jones), expose the truth about what led to the 2003 Iraq war. In the aftermath of the terrorist attacks of September 11, 2001, President George W. Bush builds a case to invade Iraq to remove Saddam Hussein from power, rather than go after the real culprit, Osama bin Laden, who's believed to be in hiding in Afghanistan or Pakistan. When no one questions the President’s decision, Landay and Strobel decide to dig deeper. Chasing down leads, they get intel from anonymous government sources in an effort to discover the President’s reasoning for going to war with Iraq.